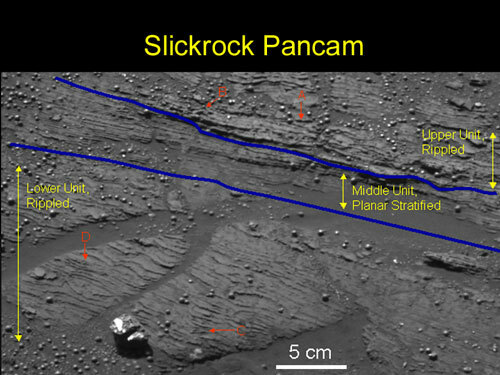 Geological examination of bedding textures indicates three stratigraphic units in an area called "Slickrock" located in the martian rock outcrop that NASA's Opportunity examined for several weeks. Interpretive blue lines indicate boundaries between the units. The upper blue line may coincide with a scour surface. The lower and upper units have features suggestive of ripples or early soft-sediment deformation. The central unit is dominated by fine, parallel stratification, which could have been produced by wind-blown ripples. Opportunity took the underlying image from a distance of 2.1 meters (6.9 feet) during the rover's 45th sol on Mars (March 10, 2004). Features labeled with red letters are shown in an enlargement of portions of the image. "A" is a scour surface characterized by truncation of the underlying fine layers, or laminae. "B" is a possible soft-sediment buckling characterized by a "teepee" shaped structure. "C" shows a possible ripple beneath the arrow and a possible ripple cross-lamination to the left of the arrow, along the surface the arrow tip touches. "D" is a scour surface or ripple trough lamination. These features are consistent with sedimentation on a moist surface where wind-driven processes may also have occurred.